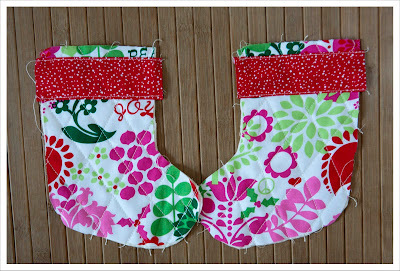 I had a few people asking for a tutorial for my Advents calendar stockings . So I thought I oblige as we are nearing Christmas in alarming speed ! 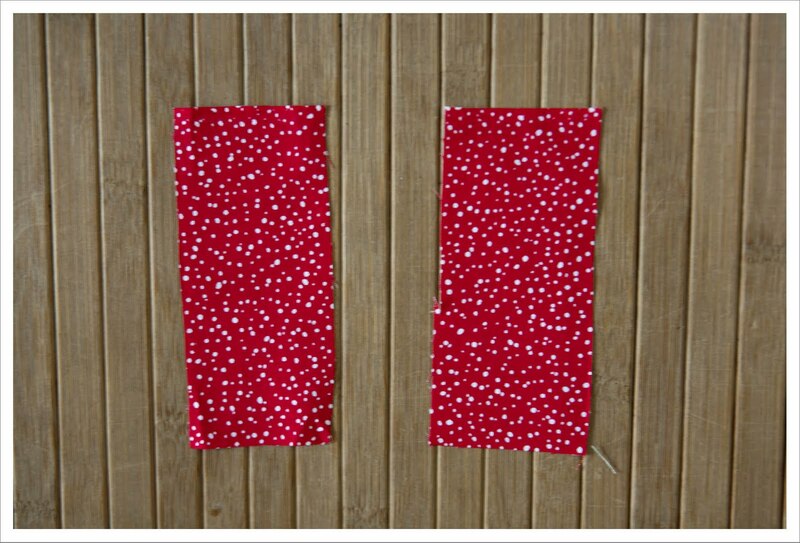 The individual stockings aren't particularly large as they are just meant for small little somethings through the time of Advent but I have created two template sizes as I want to make 4 stockings that are larger for the Advent Sundays. 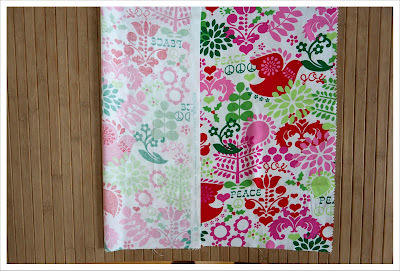 Take a piece of fabric and fold it over from left to right as in the picture. 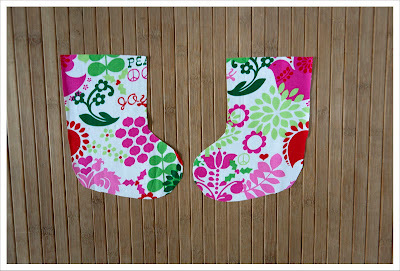 This is important when you have a directional print as you don't want to end up having one half of the stocking upside down. 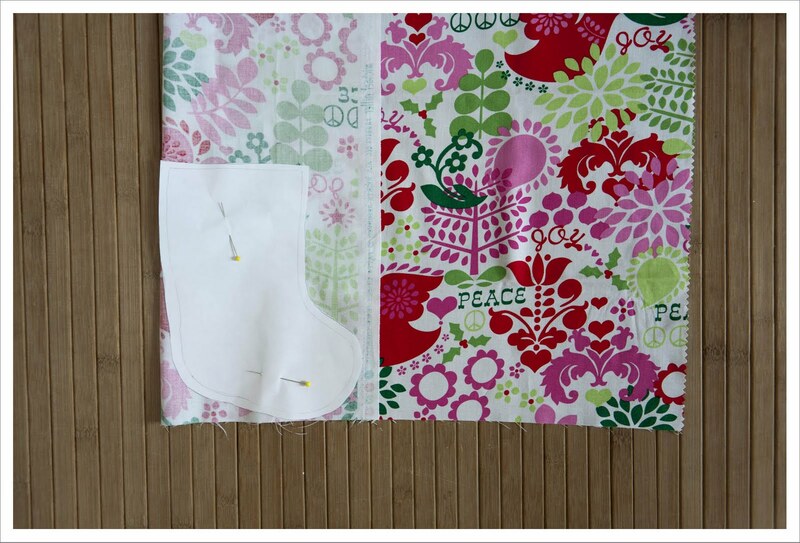 Download the stocking template, cut it out along the line and pin it onto the folded fabric. 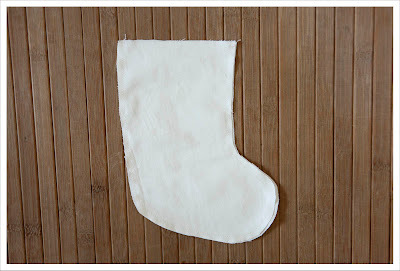 Then cut out the first stocking. 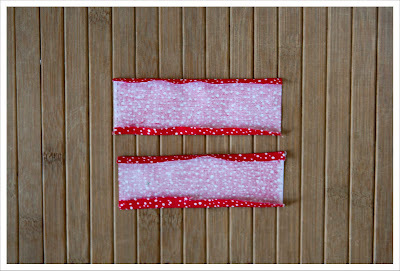 1/4 inch seam allowance is already included in the template ! 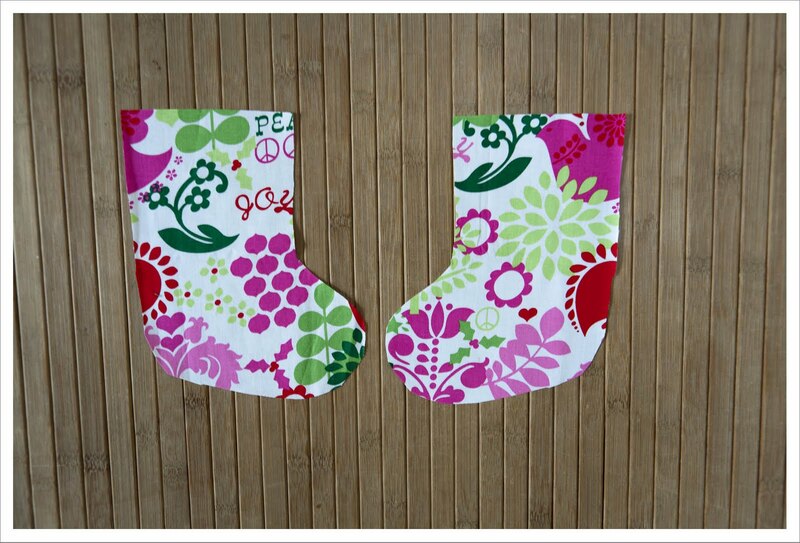 You will end up with two stockings like this where the directional prints go into the same direction. 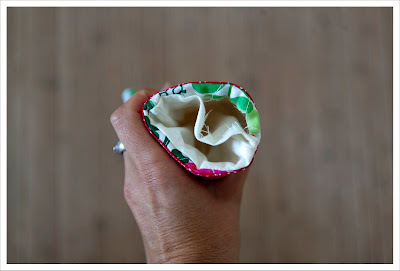 Then repeat the same process with the wadding and the lining (though you don't need to worry about print direction here). You should end up with 3 pair of booties like in the image below. 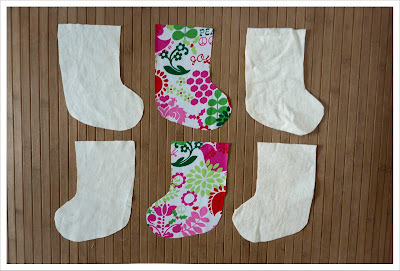 Next take your print booties and your wadding booties, pin them together and quilt in which ever pattern you prefer. 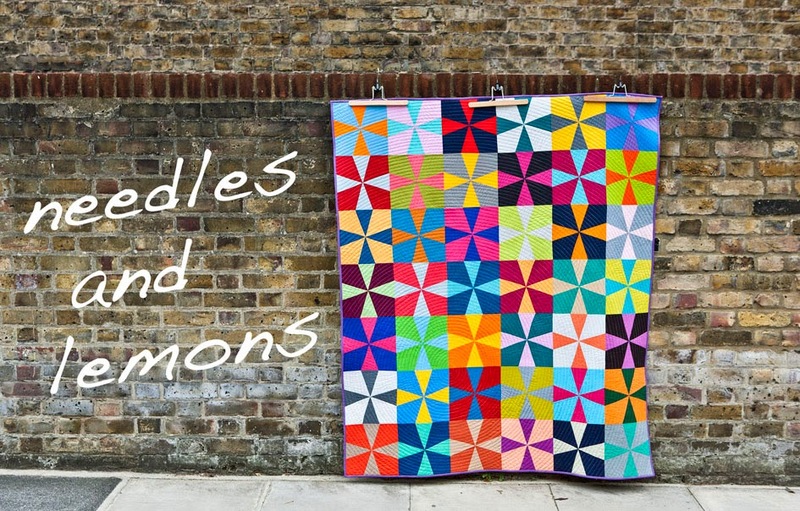 I have chose to do diagonal lines that form a diamond pattern. I have not marked any lines here and just started to quilt from the top left corner to the bottom right corner and then set the quilt guide on my machine to a 3/4 inch distance and kept this for the subsequent lines. 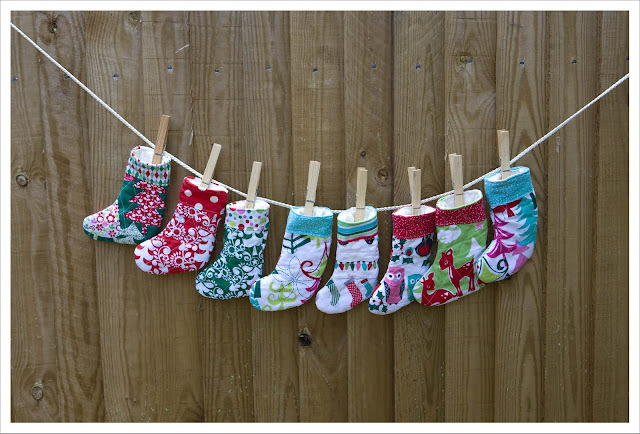 When have you done this with both stocking halfs it should look like this. 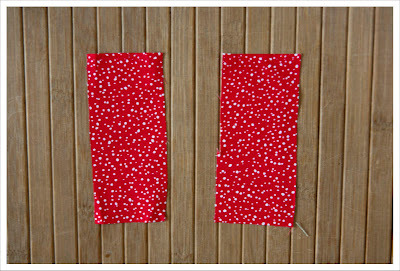 Now cut 2 strips of contrasting fabric that are each 4 x 2 inches. 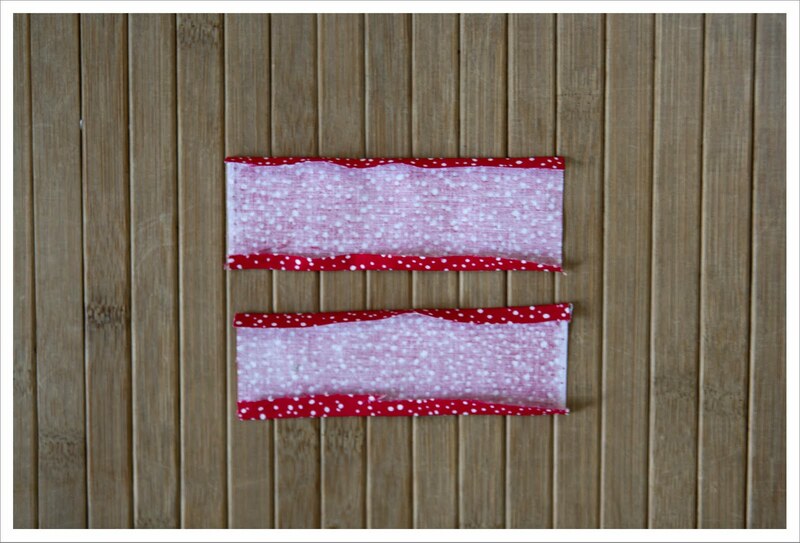 Turn the strips right sides down and press the long edges a 1/4 inch toward the wrong side.You can either finger press this or use and iron - I am using an iron. Then turn the strips around, place them on the stocking halfs a 1/4 inch below the top edge thereby taking care that the folded and pressed edges are turned in. 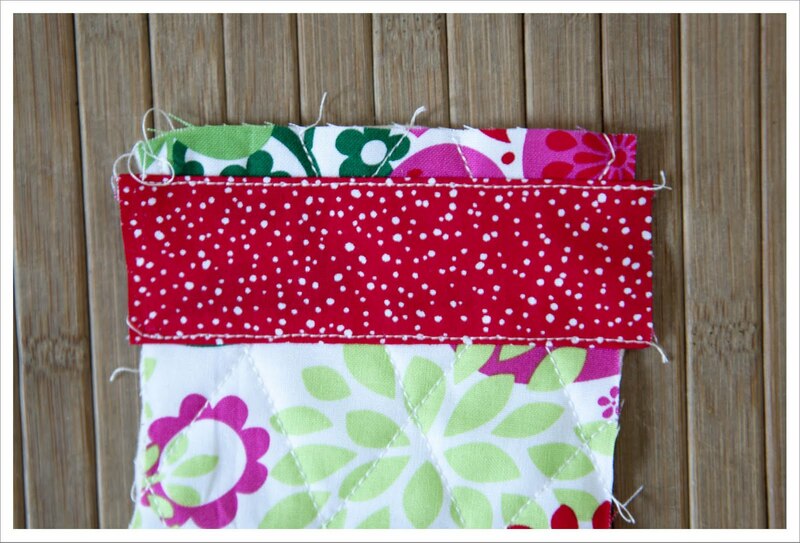 Then top stitch along the top and bottom edge to secure the strip to the stocking. The reason why I am doing these sort of fake cuffs is to minimize bulk. There are tutorials around for stockings with great cuffs but these are for large stocking and not for tiny ones likes these that are made into an Advent calendar. 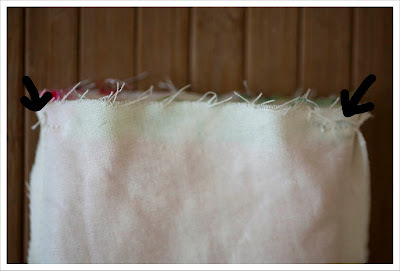 Cut the excess fabric off to get a clean edge. 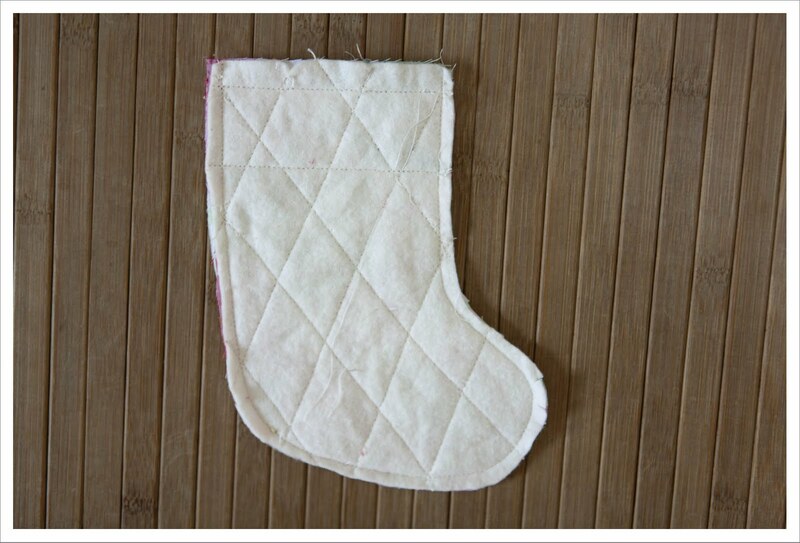 Take both booties, put the right sides together and stitch a 1/4 around the whole stocking with the exception of the opening at the top ! 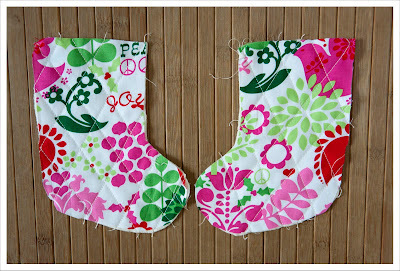 Now take both lining stocking halfs and sew them together in the same manner. Almost there. 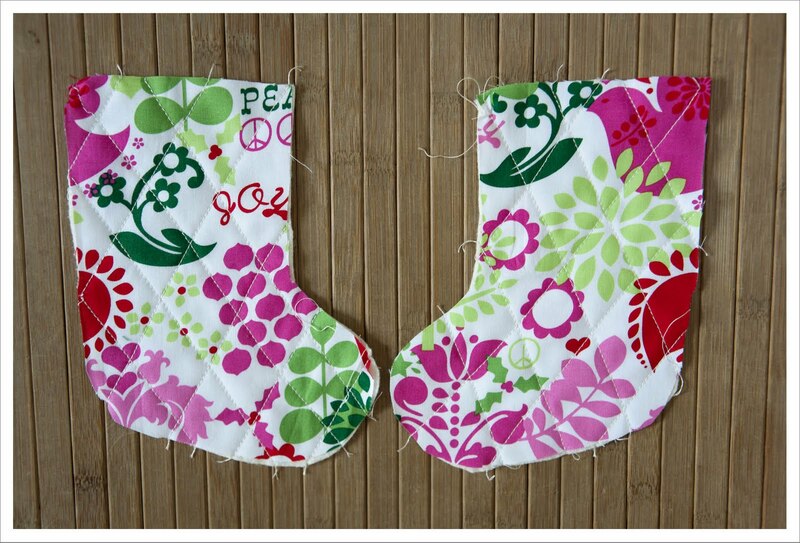 Now we put the patterned stocking and lining stocking together. 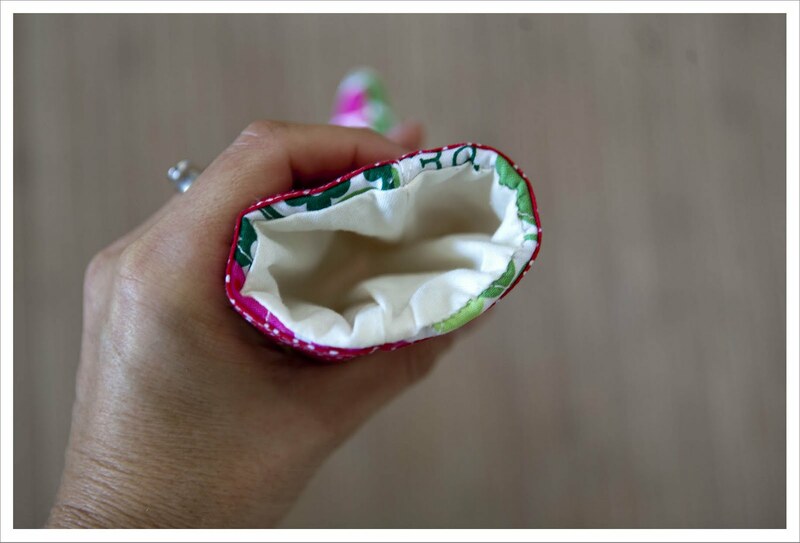 Take the patterned stocking and turn the wadding side inside and the patterned side outside (the way it should look finished) and simply put the lining stocking with the wrong side outside (!) over it. Stitch a scant 1/4 inch along the top leaving a large enough area open to turn the stocking around. 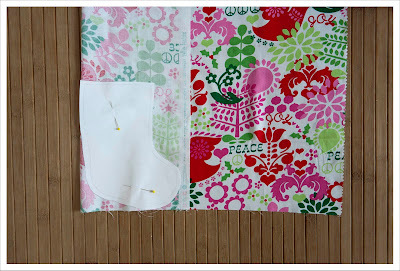 Make sure you stitch over both side seams (see black arrows in photo) which means you would leave the area between the side seam on one side of the stocking open to turn it around. The reason why I am asking to do this will become clear in a moment. 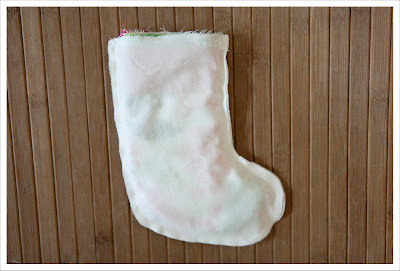 Turn the stocking inside out. You will end up with this. 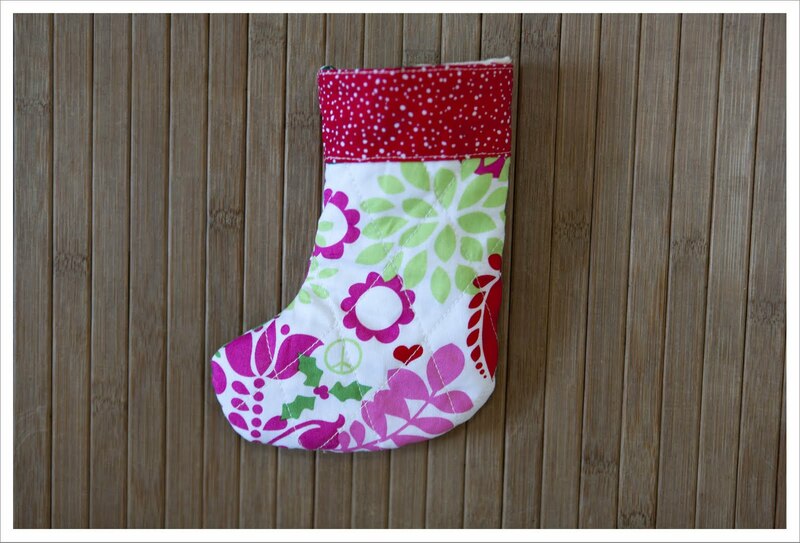 The stocking will be almost finished with the right side on the outside. 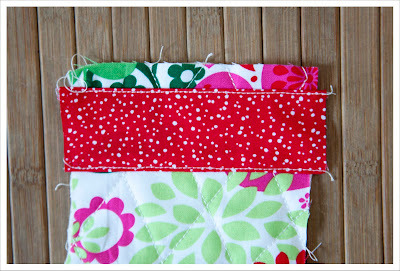 Tuck the lining into the stocking make sure to push it right into the corners. 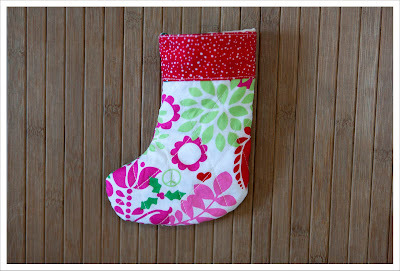 The only thing that is now left to do is close the opening you have used to turn the stocking around with a few hand sewn stitches. 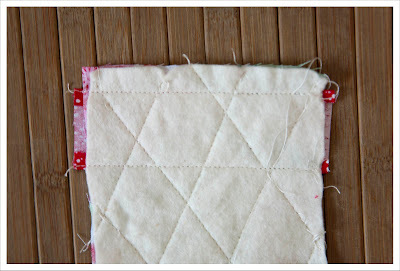 And it is much quicker to close this if you don't have to do it over the somewhat bulky side seams. And yes I am behind again. By the end of this month I will have to have produced 16 in total.....better get on with it then. Please let me know if something is not clear, wrong or confusion. This my first big tutorial and I would be grateful if you could give me honest feedback as only then I can learn from mistakes. Looks great Judith - looking forward to getting started! Oh, these are soooo cute - thanks for sharing such a clear tutorial, I've bookmarked this for future 'spare' moments!! Read it beginning to end and think it is very clear. Excellent tutorial, Judith! So sweet - I would have to make way too many for my 3 little horrors - maybe start in January for next year! This is lovely! I might try one and see how I get on, but very clear instructions and photos! so excited to have found this idea ! look forward to the end result.